“This initial package of work officially commences the integration of Meteor and SPEAR and will enhance the operational capability of the UK’s Lightning Force in the future.” Cliff Waldwyn, Head of Combat Air, Group Business Development of MBDA. 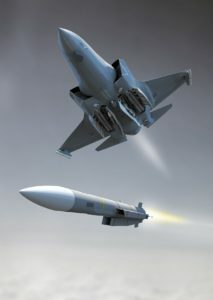 Under this initial package of work BAE Systems and Lockheed Martin will also complete further integration work with MBDA on ASRAAM and with Raytheon on Paveway IV®, initially integrated in support of delivering Initial Operating Capability for the UK. Last year, a pilot from 17 Squadron, the RAF’s F-35 Test and Evaluation Squadron at Edwards Air Force Base, California took to the skies for the first time with UK weapons, including ASRAAM and Paveway IV®.